Sub-specialties: Cosmetic surgery, medical and cosmetic rhinoplasty, reconstructive surgery, ear plastic surgery, upper eyelid surgery, lower eyelid surgery, chin asurgery, cheek augmentation surgery, fat injection , lip augmentation and other facial cosmetic procedures. Dr Soofizadeh received his M.D. from Shirzad University of Medical Sciences and his Doctoral degree in ENT from Tehran University of Medical Sciences. Dr. Soofizadeh has more than 28 years of experience in practice of medicine, including 17 years in the field of facial plastic surgery and rhinoplasty. 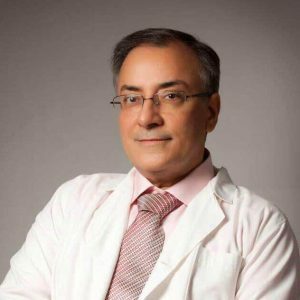 A highly skilled and experienced doctor, Dr Soofizadeh is one of the best rhinoplasty surgeons based in the capital Tehran. In addition to participating in national and international seminars and conferences, his experience has been achieved through his extensive study on the facial cosmetic procedures as well as his numerous surgeries during his professional life. Dr Soofizadeh is a dedicated surgeon who greatly honors his commitments to his patient’s satisfaction. He gives his patients a full consultation prior to their surgery, patiently listening to their questions and expectations. – Member of Iranian Association of Surgeons. – Member of Iranian Association of ear, nose and throat.